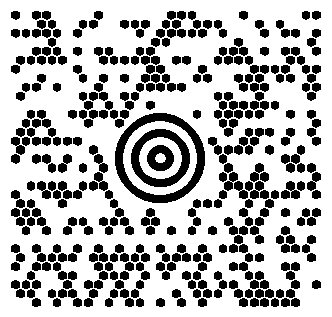 MaxiCode is a fixed size matrix style symbology which is made up of offset rows of hexagonal modules arranged around a unique bulls-eye finder pattern. Each MaxiCode symbol has 884 hexagonal modules arranged in 33 rows with each row containing up to 30 modules. The maximum data capacity for a MaxiCode symbol is 93 Alphanumeric characters or 138 Numeric characters. The symbology was designed by United Parcel Service for package tracking applications. The design of the MaxiCode symbology was chosen because it is well suited to high speed, orientation independent scanning. Although the capacity of a MaxiCode symbol is not as high as other matrix style barcode symbologies, it was primarily designed to encode address data which rarely requires more than about 80 characters. MaxiCode symbols actually encode two separate messages - a Primary message and a Secondary message. The Primary message normally encodes a postal code, a 3 digit country code and a 3 digit class of service number. The Secondary message normally encodes address data and any other required information.